You know the old adage, ‘good things come in small packages?’ It probably was never intended to refer to powder rooms, but these days it can. If ever there were a room in the house where the aim is to maximize the amount of punch you can pack into each square inch, this is it. Powder rooms are firing on all pistons. And designers are excited. There is no question of powder rooms being dealt with as if they were an afterthought. It’s all about making an impression that gets noticed. “If you’re going to spend money, that’s a good space in which to do it,” says designer Alyce Drenth, who owns Creative Avenues, a Toronto home furnishings boutique. But because powder rooms are small, it doesn’t take a crazy budget, she adds. “Redoing your kitchen is huge. Redoing your powder room is nothing,” Drenth says. So people are going for the glitz. And that means focusing on making the powder room showy. “It’s all about texture and sparkle,” Drenth says. Stone surfaces, grass-cloth wallpaper, beaded wall treatments and lighting. Keeping everything off the floor is another popular change-up, says Patricia Ee, sales and marketing director at Canaroma Bath & Tile. 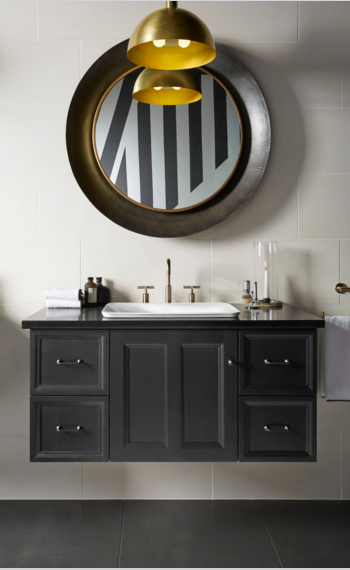 Wall-hung vanities and toilets are giving powder rooms more visual space. “They offer a modern, clean look,” she says, and they provide a practical benefit of making the room easier to clean without obstruction. And there is a “nice range of selection – all styles and all price points,” she says. In fact, adds Ee, Canaroma has been making space in its showroom for a wider selection of wall-hung models. The colours are dramatic. “Generally, the wall-hung option is the most popular with any budget,” she says. Another must have, Ee suggests, is the vessel sink. But the material vessel sinks are made of is a personal choice. Natural stone – marble and granite – also offers stylish options, with many homeowners playing with the thickness of the stone. Sleekness is in. 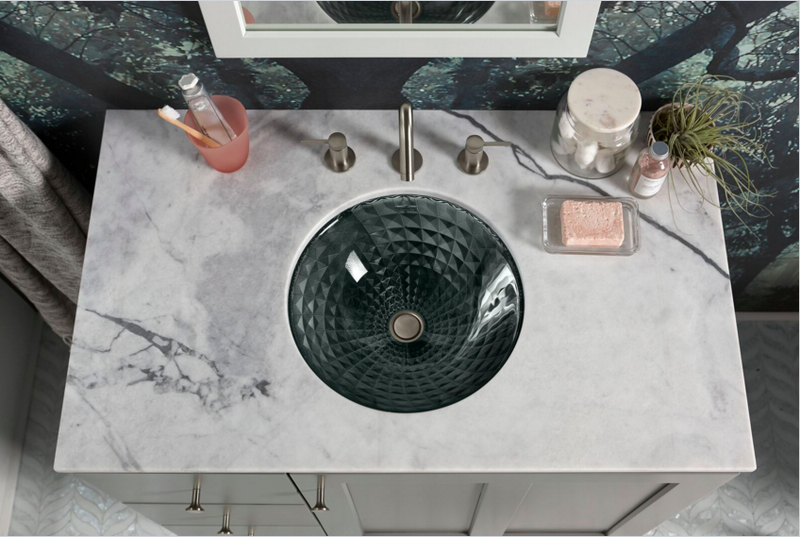 Homeowners are embracing a contemporary aesthetic, says Donna Church, marketing and communications manager with Kohler Canada, the kitchen and bathroom fixture manufacturer. It’s all about minimal, timeless beauty. And forget about neutral colours. Bold is in. 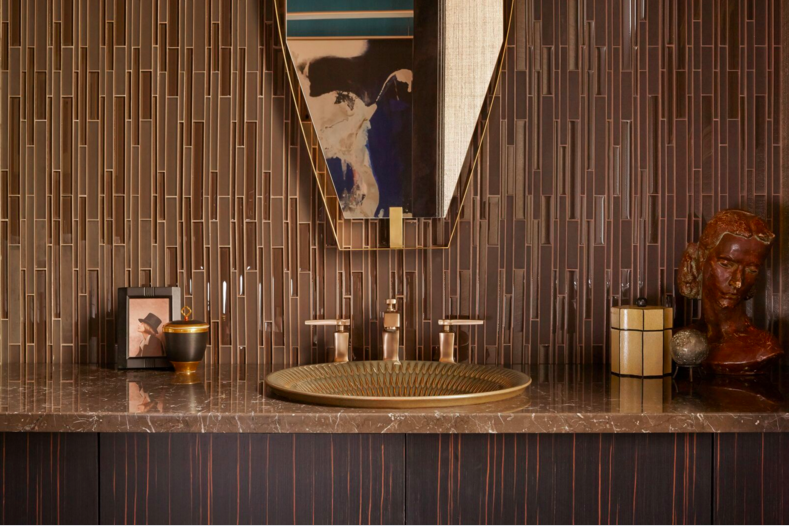 “I find that a lot of clients are moving away from the all white-and-grey look, and going toward darker wood tones with their vanities as well as bringing back black and gold faucets for their powder rooms to create a more dramatic statement,” Perfetto says. “Today’s consumers are definitely becoming riskier and experimenting more with colour in their bathrooms, not only in their vanities and plumbing fixtures, but also on their walls,” she adds.